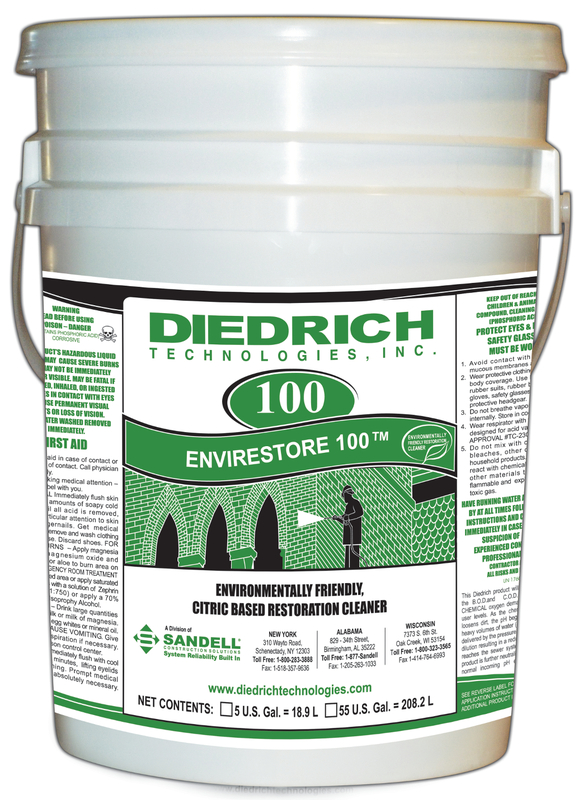 ENVIRESTORE 100™ is perfect for the environmentally conscious architect and historic preservationist who want to eliminate harsh acids. It is a citric based gentle restoration cleaner – safer, environmentally friendly, now made more effective and blended slightly stronger to take on a wider variety of surfaces. Glass safe, the product will not over-clean brick and stone. Formulated for restoring brick, sandstone, unpolished granite, terra cotta, and some limestone, this product is ideal for maintenance cleaning of dirt streaks and stains in strip malls, commercial centers, etc. 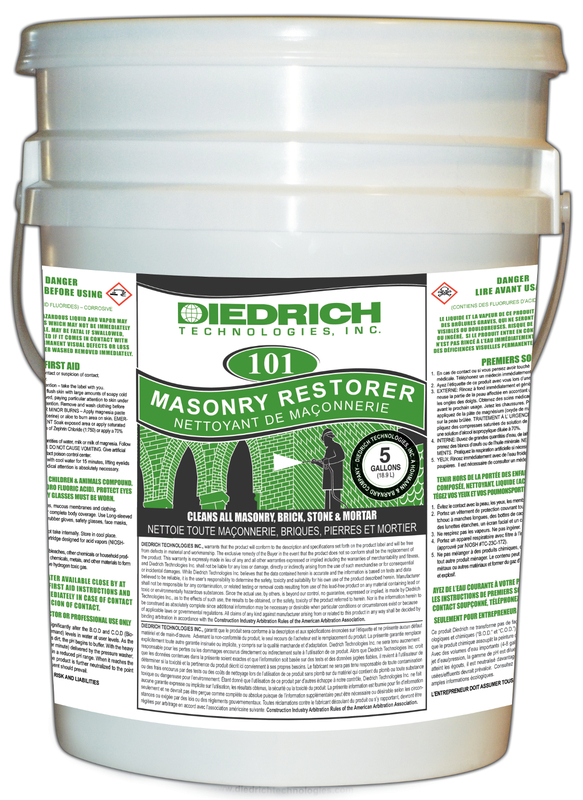 101 MASONRY RESTORER combines acids and a biodegradable detergent into a powerful clear for masonry surfaces. This cleaner penetrates, dissolves and suspends grime for easy removal by flushing the treated areas with a high pressure stream of water. It removes all airborne dirt, atmospheric carbon, rust, mildew, algae, fungus, exhaust residue, industrial pollutants, weathering discoloration, fire and smoke damage, and most other stains from rough and smooth surfaces of brick, sandstone, fieldstone, stucco, swimming pools, clay tiles, asbestos and slate shingles, some limestones, metal and wood. 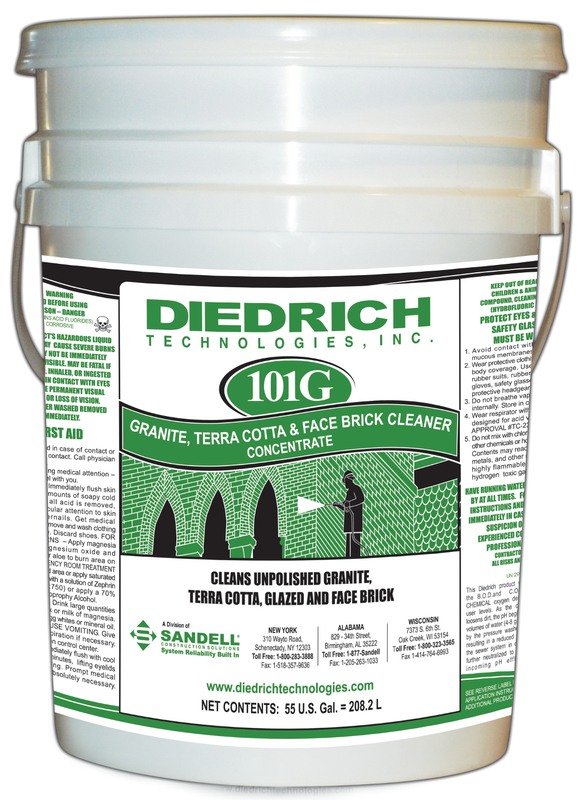 101G GRANITE, TERRA COTTA, & FACE BRICK CLEANER has a unique anti-stain formulation that inhibits the “rust” discoloration and the common yellowing caused by moisture on granite. It guarantees a natural white appearance and crystal highlight of the stone surface. 101G meets preservation guidelines for detergent masonry cleaners. Recommended for easy-to-clean face brick, glazed tile, granite and terra cotta. Do not use on polished granite or marble stone. 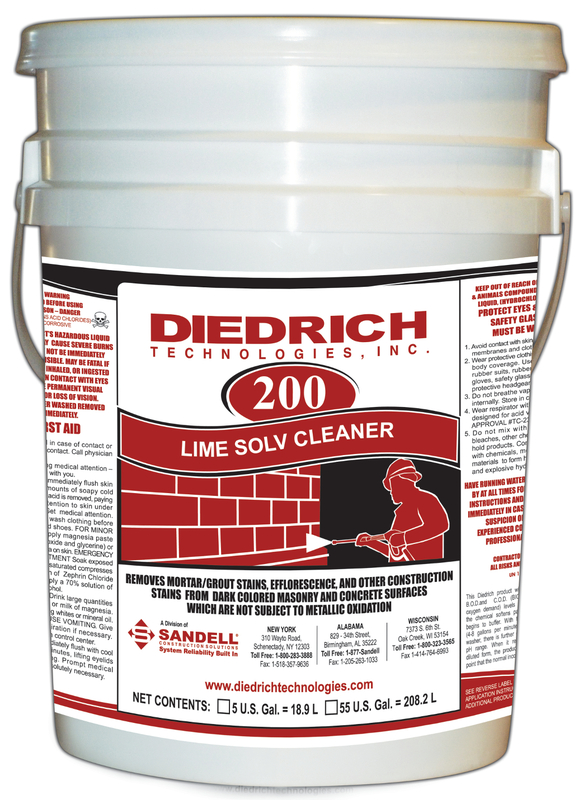 200 LIME-SOLV CLEANER is a combination of organic and inorganic acids, wetting agents and inhibitors for use in the final clean-up of new masonry, 200 Lime-Solv efficiently cleans off residual mortar, job site soiling, staining and efflorescence. It is best and most economical on red and dark colored brick, concrete block and varieties of new masonry construction not susceptible to metallic staining. The product will not discolor or damage the masonry surfaces, and is safer and more controllable than raw muriatic acid. 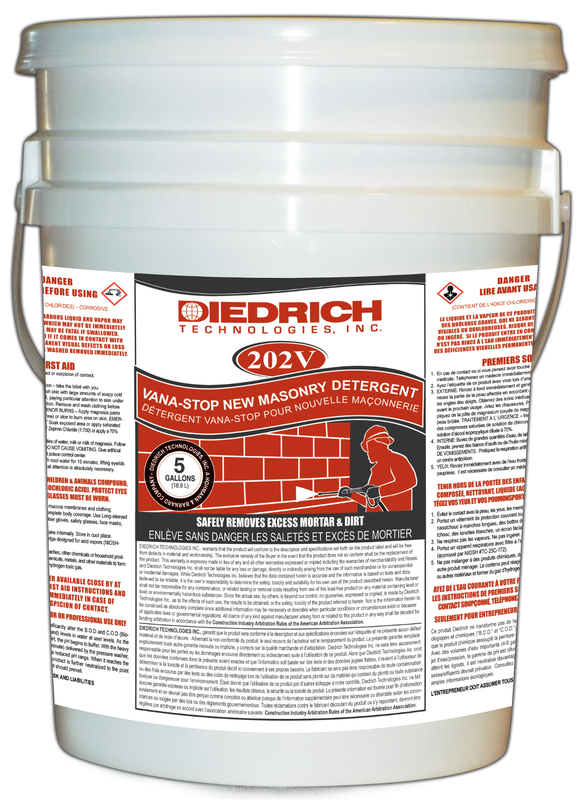 202 NEW MASONRY DETERGENT is a more productive general purpose New Masonry Detergent with a combination of organic and inorganic acids, wetting agents and inhibitors for professional use in the final clean up of new masonry, 202 efficiently cleans off residual mortar, job site soiling, staining and efflorescence. It will work on brick, stone, tile, exposed aggregate and several varieties of new masonry construction not susceptible to metallic staining. Will not discolor or damage masonry surfaces, and is safer and more controllable than raw muriatic acid. 202V VANA-STOP NEW MASONRY DETERGENT is a productive combination of organic and inorganic acids, wetting agents and inhibitors for use in the professional clean up of new masonry, 202 Vana-Stop is specifically formulated for cleaning new brick subject to vanadium, manganese, molybdenum and other metallic stains. It efficiently cleans off residual mortar, efflorescence, job site soiling and staining. It will work on brick, natural stone, tile, exposed aggregate and several varieties of new masonry construction susceptible to metallic staining. Cleaning with this product greatly reduces the likelihood of a staining occurence, thereby eliminating costly recleaning and stain removal. Will not discolor or damage surfaces, and is safer and more controllable than raw muriatic acid. 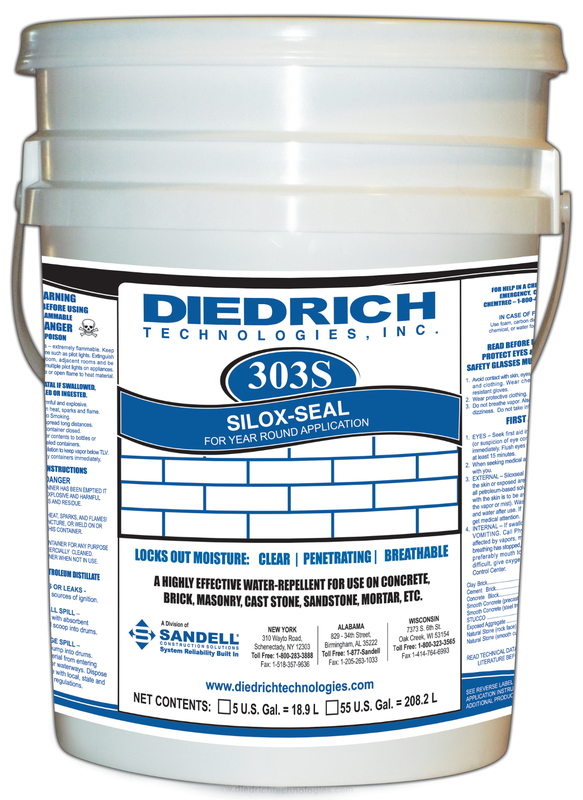 Diedrich 303-S Series Products are formulated to protect against the intrusion of moisture that causes efflorescence, leaching, mildew, atmospheric staining and freeze/thaw spalling. The 303-S Series has an excellent resistance to the detrimental effects of acid rain, and carbon buildups. 303-S products are ideal for applications to concrete flatwork, parking ramps, stadiums and vertical concrete surfaces because the migration of chloride ions through the cement is reduced, thus reducing the corrosion and deterioration of rebars in reinforced concrete. 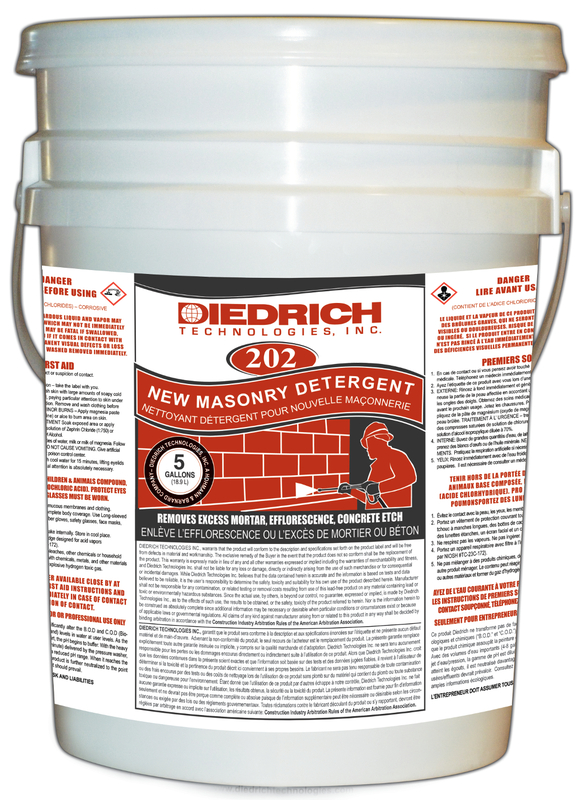 Diedrich 303-S Series Products are formulated for low-pressure spray application to masonry, concrete, stucco, sandstone, etc. Available in 7%, 10% and 15% siloxane solids. LIMITATIONS: May not be suitable for application to some types of natural stone, limestone and marble. May not be suitable for surfaces to receive surface paints or coatings; always test for compatibility, apply above 20ºF. 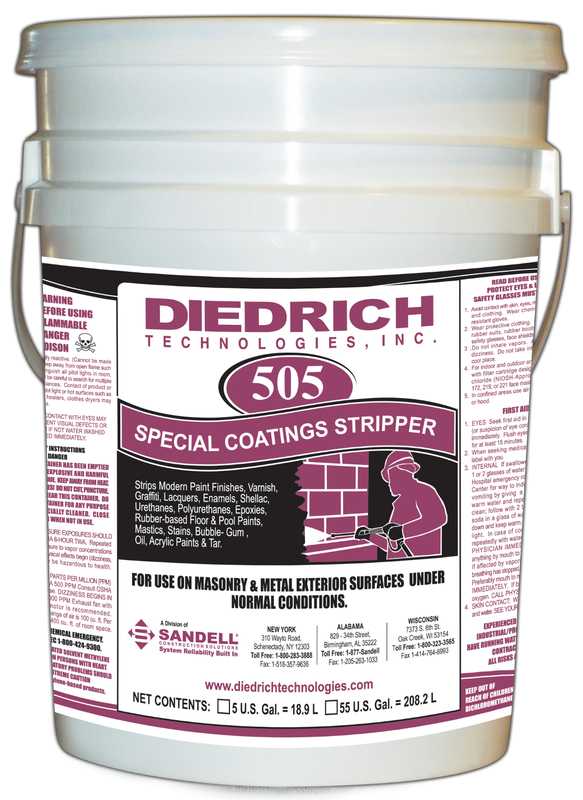 505 SPECIAL COATINGS STRIPPER: this opaque, non-flammable, water soluble, non-damaging paint remover has a viscous heavy body designed to cling to vertical surfaces. Its quick action raises the coating in 10 to 20 minutes for easy water wash-off. This thixotropic solvent can be scraped and sponged clean on interiors recommended for stripping paint from wood, as it does not require neutralization and will not raise or discolor wood grain. A special added inhibitor prevents pre-mature dry out. The product contains no caustic alkali, acid or benzol. A resin solvent is added for extra solvency on hard-to-lift complex paint resins such as epoxies, urethanes, rubber-basse, elastomerics, enamels, etc. 606 CAUSTIC PAINT REMOVER is designed to DISSOLVE AND REMOVE oil base, lead base, latex paints and varnishes from masonry and metal exterior surfaces under normal conditions. 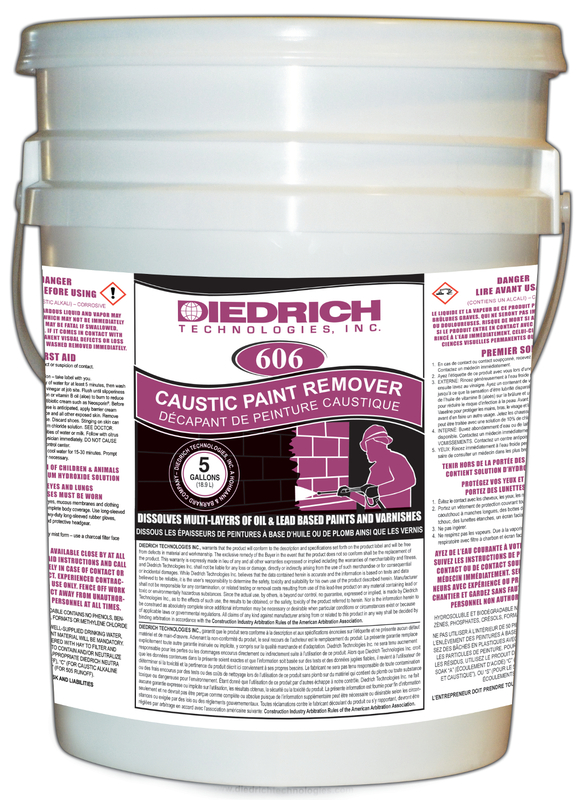 Diedrich 606 paint removers are specially thickened potassium hydroxide solutions which are both biodegradable, when neutralized, and soluble in water. Diedrich 606 are applied without dilution. A thick coat of remover may dwell from 1 to 24 hours, depending on the number of layers and the types of paint. 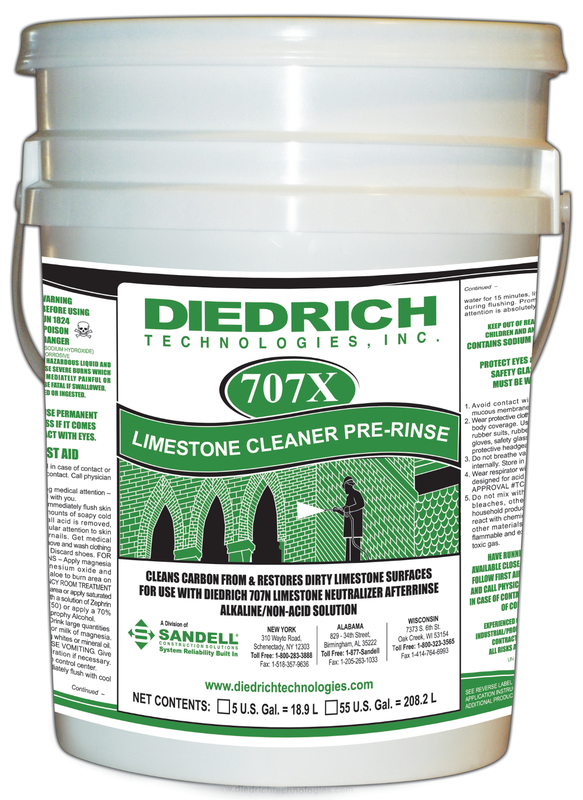 On masonry, use Diedrich 101/101G as an afterwash to clean the dirt and residue that may be left after the paint removal. 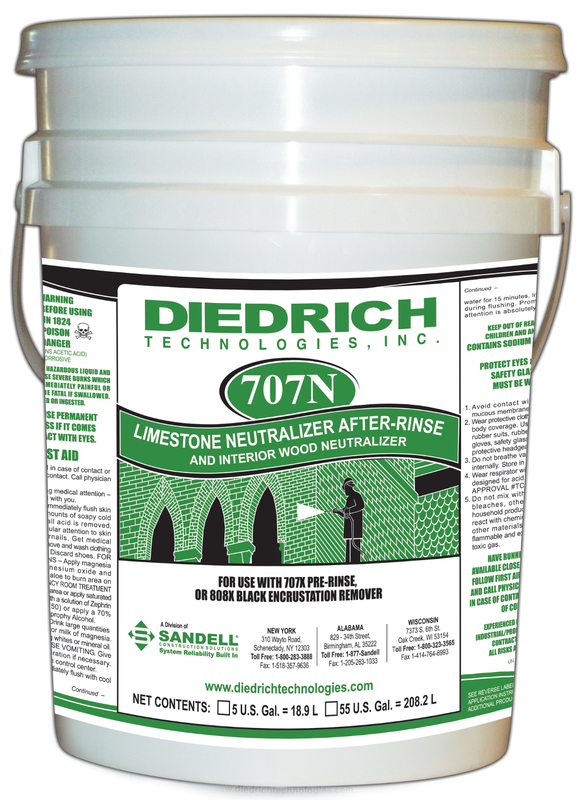 707N LIMESTONE NEUTRALIZER AFTER-RINSE when used with Diedrich 707X Limestone Cleaner and 808X Black Encrustation Remover this product cleans and restores the dirtiest limestone without damaging the masonry surface, restoring its light gray appearance. It can be applied with low pressure spray, brush or roller, and it will not harm glass. 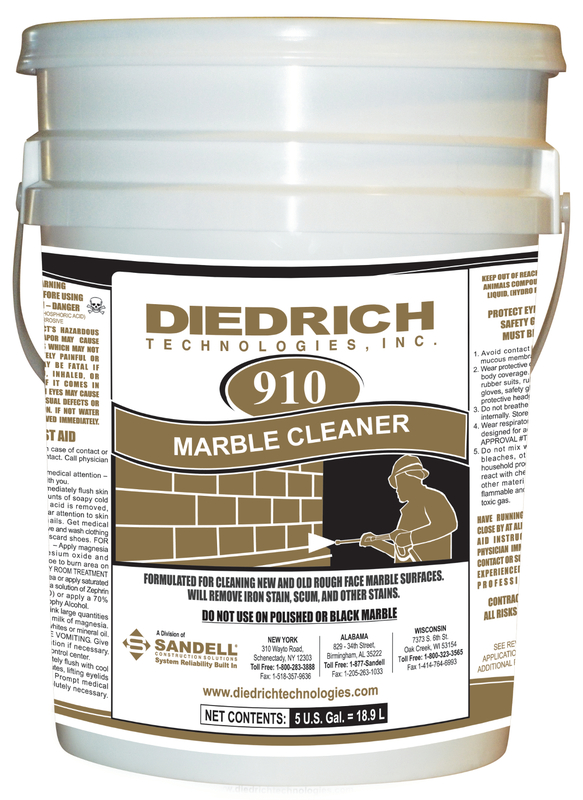 910 MARBLE CLEANER cleans and brightens new and old marble surfaces. Removes iron stains, oil, scum, grease and other stains and is designed for rough marble surfaces. Do not use on polished marble or granite. 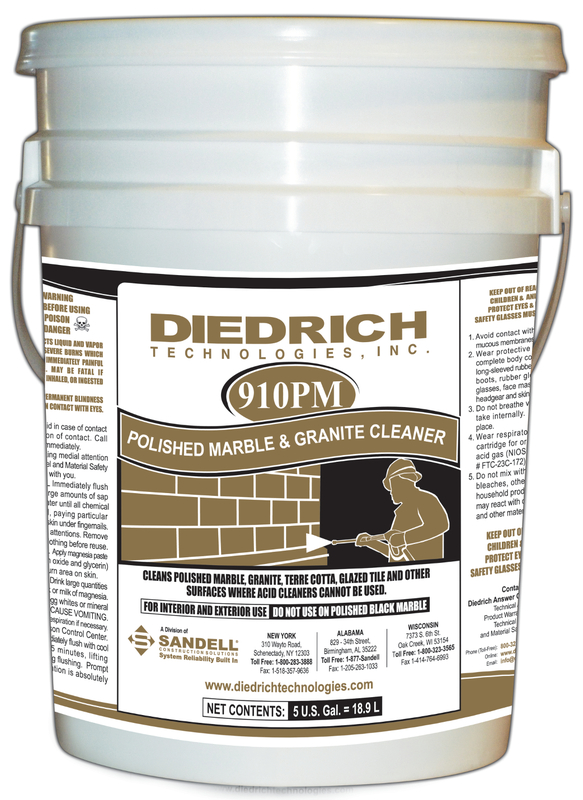 910PM MARBLE CLEANER is ideal for cleaning polished marble, granite, terra cotta, glazed tile and other surfaces where acidic cleaners cannot be used. Do not used on polished black marble. 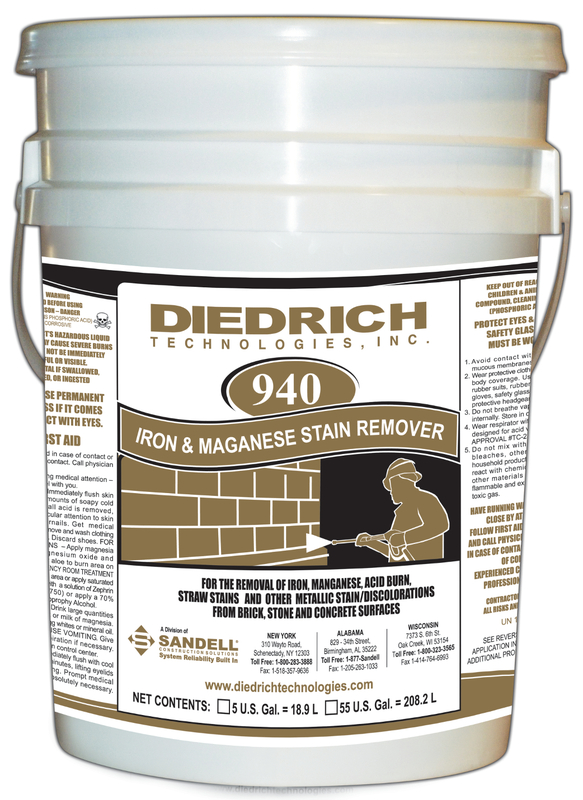 940 IRON AND MAGANESE STAIN REMOVER is formulated for the effective removal of iron, maganese, acid burn, straw stains, and other metallic stain/discoloration from brick, stone, and concrete surfaces. 960 HEAVY DUTY CONCRETE CLEANER is formulated for the removal of dirt, rust, retarders, and mud stains from rough stucco, precast finishes, concrete with a heavily textured surface, and sand-blasted surfaces. Also used as an economical way to correct color and texture irregularities. 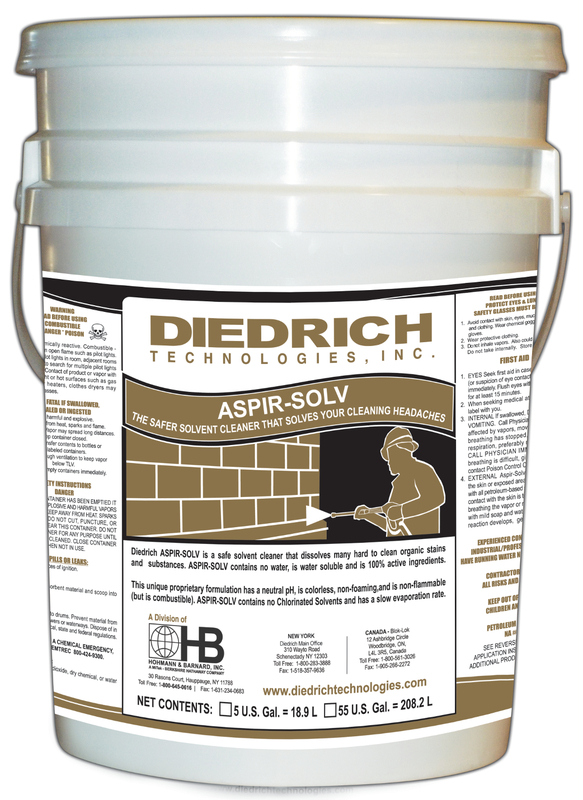 ASPIR-SOLV SAFER SOLVENT CLEANER is a safer solvent cleaner that is ideal for the removal of oil and grease stains, hydraulic and auto fluids, tire marks from concrete, stone, brick paving blocks and concrete block. 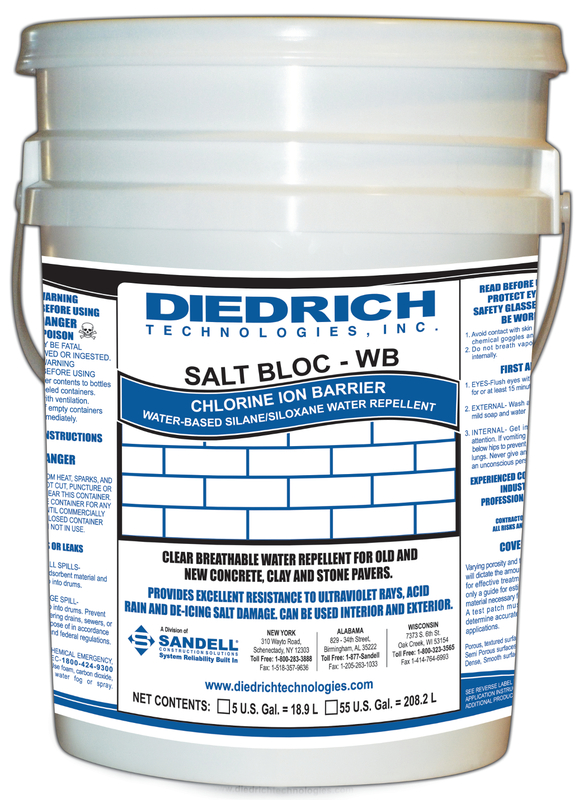 SALT BLOC WB CHLORINE ION BARRIER is a water-based silane/siloxane water repellant that is formulated to block the absorption of chloride ions from de-icing salts into concrete, brick, and concrete paver sidewalks and driveways. Salt-Bloc is an all-purpose, deeply penetrating siloxane water repellent and chloride barrier for concrete and pavers. The product protects against the intrusion of moisture causing effloresence, leaching, mildew, and atmospheric staining. Salt-Bloc is resistant to the detrimental effects of acid rain and carbon buildups. It is ideal for use on horizontal surfaces, and may also be used on retaining walls, bridge pilings and other vertical concrete applications.